After years of working abroad for the State Department, Donna Moore settled on Bainbridge Island where she learned to appreciate local Native American culture. Her 2009 book, Out Of the Fog reflects that love and takes place in Suquamish, on Blake Island, and on Bainbridge. Readers get to meet Dan Waterson, a middle-aged ferry boat captain, who lives life in a sort of fog, ignoring the spiritual teachings of his Suquamish grandfather. As the book progresses, Dan comes to appreciate the traditions of his elders and through them learns the greater purpose in his life - to take responsibility for himself and his family, to be a leader to his people, and to alert them about the state of the declining environment. 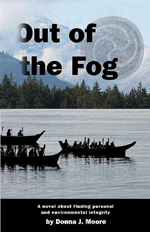 Out of the Fog will be especially appealing to anyone interested in Salish culture, shamanic traditions, and the environment. Profits from the sale of the book go to the Suquamish Tribe. 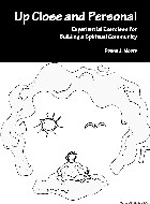 Donna Moore is also author of two non-fiction works and a booklet of haiku poetry. For more information on all of her works go to http://www.donnamoorebooks.com/.